During the morning of Friday 30th Tony Taylor ringed 15 birds, including the first four Willow Warblers of the year. Other migrants present were: eight Goldcrests, eight Chiffchaffs and a male Brambling. During the morning of Thursday 29th, Tony Taylor ringed a single Chiffchaff (the first of the year to be ringed) and two Goldcrests. He also managed to read the colour-ring combination of one of the island's returning Wheatears – a male ringed as a one-year-old bird in 2017 at exactly the same spot as Tony resighted it. 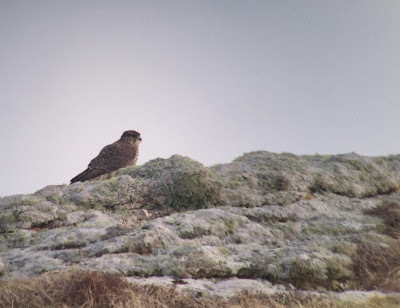 Other sightings during yet another decidedly un-springlike day included six Teal, a flock of nine Cormorants flying north, seven Swallows (seen at Jenny's Cove by Darrin Dowding), the same female Merlin as reported previously, two Redwings in Millcombe and a pair of Stonechats. In Tony Taylor's words Tuesday 27th was "wet & windy with nothing to report beyond five Water Rails, two Chiffchaffs and seven Goldcrests." On Wednesday 28th, "Ann saw a Swallow, but definitely not summer." Also seen were two Fieldfares, 11 Redwings, a pair of Stonechats and a female Bullfinch. Grant Sherman saw a Hooded Crow and there were fresh pluckings from a predated Woodcock in St John's Valley. There were four Water Rails that Tony says, "included a pair in Smelly Gully that stuck very closely together, as they did on 27th and one singing in St Helen's Field this evening." Tony Taylor spent the morning of Sunday 25th mist-netting and the afternoon checking Manx Shearwater nestboxes on the West Side. Among the birds ringed were three Goldcrests. The shearwater colony showed plenty of evidence of fresh activity this season already, with new excavations, droppings at burrow entrances, new nest material in a box used last year and three piles of feathers from predated birds. Other sightings included a Great Northern Diver, a Jackdaw (Tent Field), three Wheatears and two Harbour Porpoises (off South West Point). Monday 26th brought hints of a small arrival of migrants, including seven Goldcrests, two Chiffchaffs and a Brambling in Millcombe during the morning. Elsewhere, there were six Teal (3m,3f), a Great Northern Diver, 106 Puffins at Jenny's Cove (with up to seven ashore), a female Merlin, a Jackdaw (St Helen's Field) and five Wheatears (including two colour-ringed birds, but neither seen well). Rain has now stopped play for the day. Tony & Ann Taylor report single Great Northern Diver, Golden Plover and Redwing on 23rd March. Their sightings on Saturday 24th included: four Teal (1m,3f), one Red-throated Diver, four Gannets (off South West Point), three Snipe, eight Oystercatchers, eight Woodpigeons, five Goldcrests, four Wheatears (low down on the sidelands – none seen well), three Dunnocks, five Pied Wagtails, 70 Meadow Pipits (including birds moving through towards the NW), five Chaffinches (Millcombe), one Linnet and one Goldfinch. Also a Harbour Porpoise off South West Point. 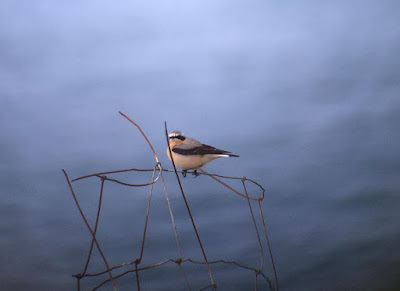 "There seemed to be a mass evacuation of migrants from the island just before the storm, luckily, but a few did linger including a beautiful female colour-ringed Wheatear below Benjamin’s Chair (see photo). All the seabirds disappeared from the cliffs and coastline too, bar some gangs of gulls which have been following Tom about to grab a quick meal of sheep feed in the Generator Field and on Ackland's Moor (c350 Herring Gulls today). Other than that there hasn’t been much about to count as the birds have hidden themselves well from the cold. 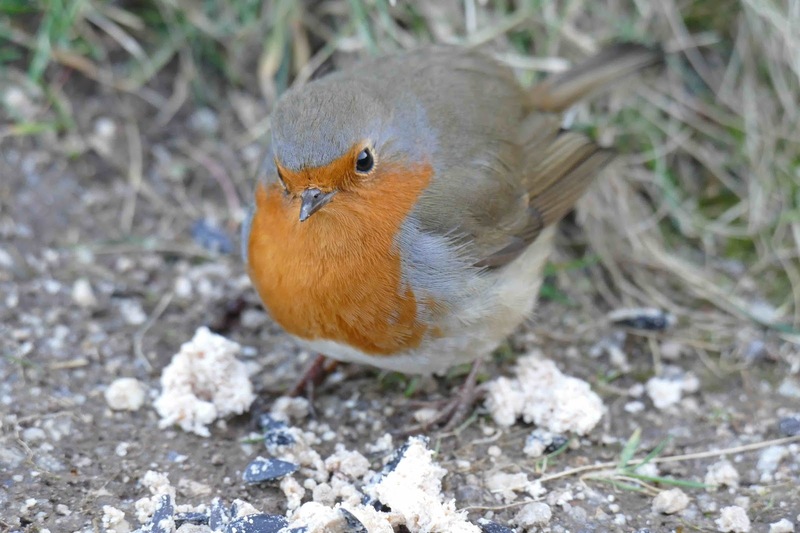 I did have one Skylark singing its heart out in a snow flurry on Saturday afternoon which was a massive surprise – poor thing must be well eager to get on with breeding." Tony Taylor reports that the Wheatear was ringed at Benjamin's Chair on 25 May 2014 and has been seen there regularly every year since, breeding successfully in 2015, 2016 and 2017. As Tony says, "Let's hope she has the reserves to see her through to some real spring weather." 8th to 16th March – First Wheatears, hirundines, Chiffchaffs and... Puffins! The following is the latest round-up of sightings from Lundy Warden Dean Jones, including exciting news of the arrival of the first summer visitors. What a difference to two weeks ago! 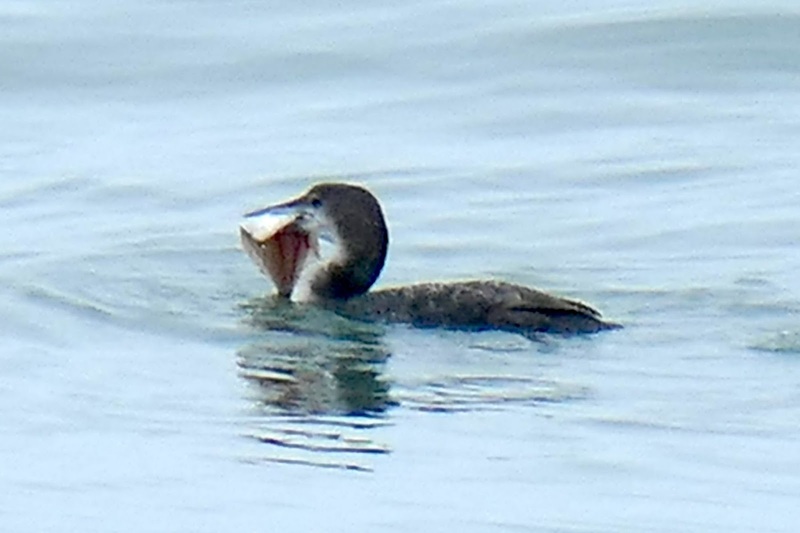 Red-throated Diver: Five were feeding in the Landing Bay mid-afternoon on 14th, and four today (16th). Sparrowhawk: A lone bird was perched on the rocks above the Old Light colony on 15th. Puffin: 10 on the water in Jenny’s Cove on 14th were the first of the year. Woodpigeon: A reasonably high count of 12 in Millcombe on 14th. Merlin: Two seen together on 15th, just south of Threequarter Wall (photo). Goldcrest: A very handsome male was seen feeding in the Turkey Oaks next to Smelly Gully on 9th – the first of the spring. One possible female was feeding in Smelly Gully today (16th). Hirundines: The first Sand Martins were recorded yesterday (15th) too (a day earlier than the first of 2017). The count comprised three in total – one bird over Millcombe in the early morning (Dean Jones) and two feeding in St John’s in the mid-afternoon along with a gang of three Swallows (Rob Waterfield & Pete Lambden). Chiffchaff: Two feeding along the margins of Millcombe Pond on 14th were the first for the year. Three were present on 15th & 16th, again in Millcombe. Song Thrush: Only one record of a single bird in Millcombe on 15th & 16th. Redwing: A mass evacuation of thrushes occurred over the weekend; only two Redwings have been recorded since 8th – one on 14th near Halfway Wall and one next to Quarters on 15th. 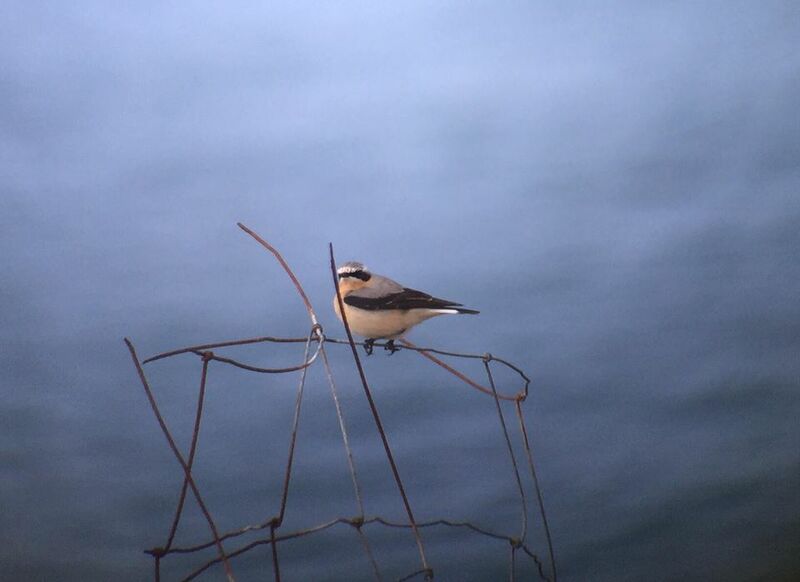 Wheatear: A single bird on 12th on Ackland’s Moor (near Quarter Wall) was the first of the spring (Zoë Barton). Three were present yesterday (15th), including an unringed bird near the Battery steps (photo) and the first returning colour-ringed bird at Benjamin’s Chair, together with an unringed female. Pied Wagtail: Max of four on 15th & 16th with a singing male in the Village next to the Tavern on 14th. Grey Wagtail: One in Millcombe on 14th (Nick Herbert) and one over St John’s Valley today (16th). Meadow Pipit: c.150-200 were counted in a period of 10 minutes from the Castle Parade (Zoë Barton whilst on housekeeping duty! 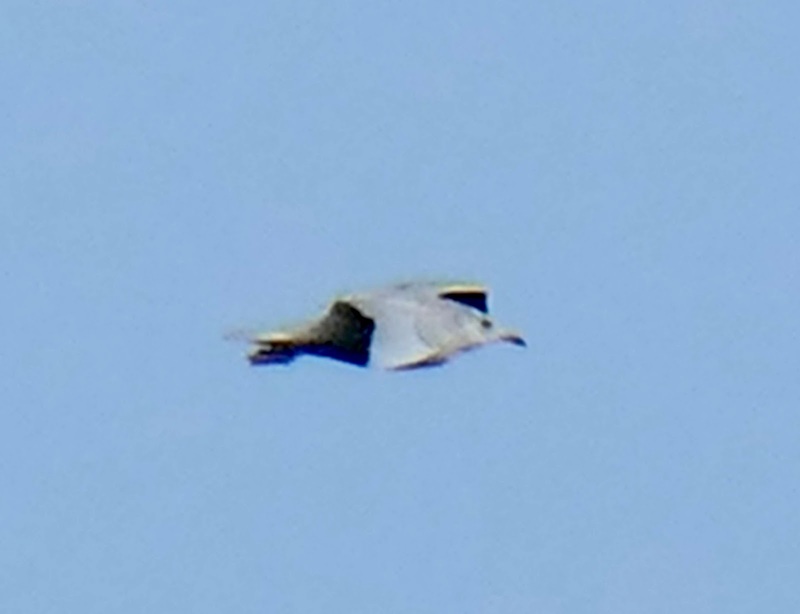 ), 100+ over the village on 13th & 147 counted from the South End to Threequarter Wall on 15th, including large flocks of 50+ feeding birds near Benjamin’s Chair and St Mark’s Stone. In addition Dean reports that "There was lots of breeding activity recorded yesterday, with many singing birds, gangs of Dunnocks chasing each other through the gorse and Blackbirds and House Sparrows collecting nest material. Oh, and not forgetting the non-avian highlights: the first Common Carder Bee was recorded on 13th and the first Peacock butterfly was seen sunning itself below Benjamin's Chair this afternoon (16th)." Dean Jones summarises the period 2nd to 7th March, when snow and freezing temperatures early on were very much the watchwords. 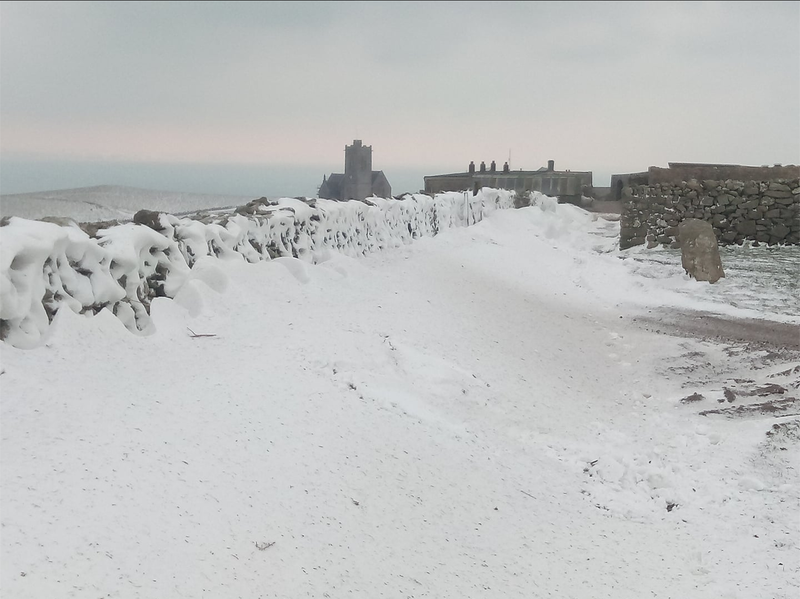 Friday 2nd March: Unsurprisingly like elsewhere in the country, Saturday was a very cold and extremely windy (gusting 70+mph) day with lots of hail and snowfall adding to the already towering snow drifts along the roads and thick carpets on the plateau. After a few days of very cold weather previously, the ground (and everything else at that matter) had frozen solid, making it extremely difficult for a lot of birds to find food. Unsurprisingly, conditions for birding were very poor but I did manage to get out of the wind somewhat on the SW point for a few hours. Here I witnessed numerous birds, mostly thrushes, desperately trying to leave the island for a more hospitable place to hide away from the rest of the storm. A total of 17 Song Thrushes, 12 Redwings, 14 Skylarks and a lone female Stonechat were seen moving south along the sideland and out to sea past Great Shutter Rock. Most of these birds, once out past the point, were immediately met with the strong easterlies, leading them to make a hasty retreat back to the island. A few Song Thrushes were not so lucky and were flung right out to sea, eventually disappearing from view – desperate times! Additionally flying around Great Shutter Rock were two Lapwings, 12 Common Gulls (mostly adults) and two adult winter Black-headed Gulls. I then tried to pop over to the east coast as I had been told there were some big flocks of gulls being pushed close to the lower shore. I found very little shelter in the Ugly but did manage to pick out a further three Common Gulls and another adult Black-headed amongst the hundreds of feeding Herring Gulls. Saturday 3rd March: The strong easterlies continued throughout the day but instead of more snow we received some well needed rain and a slight rise in temperature. The first round of birding produced some impressive numbers of Herring Gulls in Tillage Field and within the Landing Bay (total c.800). In the bay, birds were attracted to and were busily feeding on washed up bits and bobs on the lower shore, brought forth by the lofty easterly swell (see photo below). The biggest surprise though was a total of 152 Common Gulls (mostly adults) and 11 Black-headed Gulls within the mixed Larid frenzy. • A Grey Heron seen flying east near the Quarries (Dave Oddy). • 15 Fieldfares, 35 Redwings, 10 Blackbirds and 13 Song Thrushes all scattered around the village, Millcombe Valley and SW Point. • Two Stonechats (1 male & 1 female) in SW Field. • A lone Lapwing near the Old Light. • Four Snipe flushed from within Millcombe Valley (one from the edge of a gorse bush next to Old School). 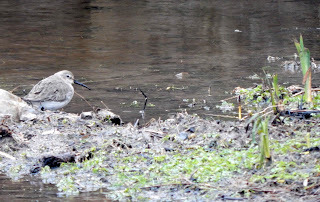 • A lone Dunlin busily feeding in Millcombe Pond (see photo below). • Finch numbers still low: two Linnets. Sunday 4th March: A beautiful spring-like morning/early afternoon, complete with singing Skylarks and seabird-covered ledges – quite the contrast to the previous two days on the island. • Gannet: a count of 12, most of which were seen from the North end – the highest count yet for 2018. • Fulmar: 185 on ledges in Long Roost, Gannets’ Rock and Jenny’s Cove. • Cormorant: two were seen flying east past Rat Island mid-morning. • Curlew: one over the village in the early morning. • Common Gull: an adult bird and two 2cy individuals in the Landing Bay. • Black-headed Gull: a beautiful adult summer bird and a single 2cy. 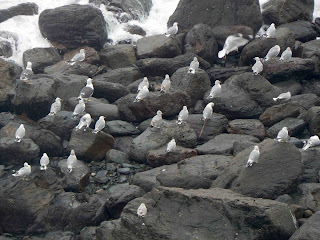 • Kittiwake: a total of 80 were counted on ledges in Aztec Bay and Jenny’s Cove. • Guillemot/Razorbill: an estimated 2,000 in rafts along the West Side and on ledges (Mandy Dee & Andy Bell). • Woodpigeon: three above the Terrace being chased by a Peregrine (Trevor Dobie). • Sparrowhawk: one seen above the farmyard in the afternoon (Trevor Dobie). • Redwing: 257 scattered all over the island from SW Point up to the North Light. Main congregations of birds were found in Barton’s, Tillage and Brick Fields. • Fieldfare: a total of 20 birds scattered around the island. • Song Thrush: 14 birds, most of which were in the Millcombe/Farm area. • Blackbird: seven, again mostly in the Millcombe/Farm area. • Pied Wagtail: four in Tillage/Brick Fields. • Stonechat: a female in SW Field and a pair near the North End. • Meadow Pipit: a noticeable increase of birds (42 counted), most of which were seen in small mobile flocks beyond Threequarter Wall. Monday 5th March: A reasonably calm but very wet morning and afternoon. • Still lots of thrushes about but the highlights of the day were two Manx Shearwaters flying SW past Rat Island in the early morning, and two very showy Water Rails feeding together in Smelly Gully. 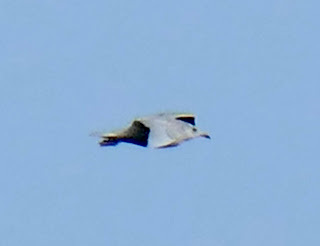 Additionally a Curlew, thought to be the same bird as yesterday, was heard calling in Tillage Field. Tuesday 6th March: A lovely warm, still and sunny day. • Good numbers of thrushes still about: 140 Redwings, six Fieldfares, eight Song Thrushes and 12 Blackbirds. • Small arrival of Pied Wagtails: eight counted from the Village/Pondsbury area. • Noticeable arrival of Stonechats, with a total of eight males and four females, most of which were found in the Pondsbury area. • Skylark: 21 scattered in areas from Halfway Wall south. • Meadow Pipit: 42 scattered in areas from Halfway Wall south; first displaying bird of the year was seen/heard near Quarter Wall. • Kestrel: one hovering over Ackland’s Moor mid-morning. 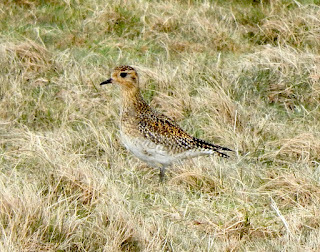 • Golden Plover: three in SW Field (see photo below). • Highlight of the day was a total of 12 Red-throated Divers and a lone Great Northern Diver in the Landing Bay at around 15.00. Wednesday 7th March: Another beautiful sunny day but a tad colder due to reasonably strong SW winds. • Thrush numbers lower than previous days: 48 Redwings, one Fieldfare, six Song Thrushes and 14 Blackbirds. • Continued arrival of Stonechats, with 13 males and 11 females noted – most of which were found on Ackland’s Moor near the ‘Pointless Wall’. • Merlin: a female perched on the ground in SW Field in the early morning. • Woodpigeon: six in Millcombe Valley. • Water Rail: a total of four – two in Smelly Gully and two next to Millcombe House. • Teal: two drakes and five ducks on Pondsbury. • Super diver numbers were again the highlight of the day. 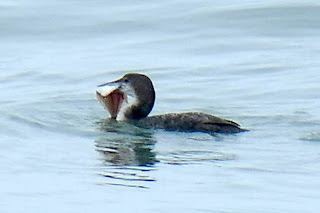 A total of nine Red-throated Divers were feeding in the Landing Bay in the early afternoon, along with a lone Black-throated Diver in near full summer plumage – what a bird! 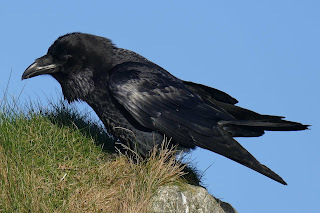 Along with a Raven and a lovely portrait of a Robin, below are record shots of the scarcer birds Martin Thorne was able to capture during his stay on Lundy in February. Of the Robin, Martin says: "The Robin was at Quarry pond, a character to say the least; he's very bold, demands food and unbelievably I was feeding the fish and he flew out to pick up a large piece of bread from off the water." Along with much of the rest of the country (and indeed continental Europe), Lundy is experiencing its most severe winter conditions for many years, with frozen water pipes among a variety of challenges for staff and visitors, not to mention the LFS Working Party (see photos on the Lundy Island public group Facebook page) who have been on the island all week. Needless to say, the weather must also be having a serious impact on Lundy's birds, whether residents, 'normal' migrants or refugees fleeing the mainland in a futile attempt to find less harsh conditions. 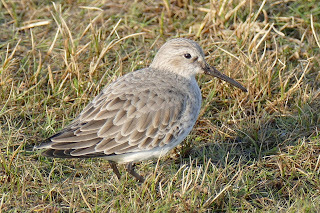 The following is Dean Jones's latest roundup of recent sightings, up to and including 1 March, the first day of meteorological spring...! Red-throated Diver – Four off SW Point on 24th Feb (Martin Thorne). Teal – Counts on most days with a max of eight on Pondsbury on 26th. One drake was found on Quarters Pond on 27th, probably an individual from Pondsbury trying to escape the relentless chill of the wind. Mallard – Eight on 27th and again on 1st from Quarters Pond. Gannet – Four on 25th and one on 28th; still very scarce. Cormorant – Two birds at the North End on 23rd. Golden Plover – Three birds present above Benjamin’s Chair on 28th and 10 on 1st, scattered around SW Point desperately trying to find a place to shelter out of the wind. Lapwing – A flock of 26 was seen flying over the helipad field by Pete Lambden whilst on helicopter duty on 26th. 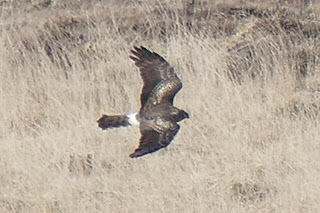 Twenty on 27th comprised a flock of 18 moving north near Pondsbury and two roosting individuals near the water tanks. Nine present on 28th and five on 1st, hiding from the blizzard-like conditions near SW Point. Woodcock – Two flushed from the long grass south of Pondsbury by LFS Working Party members who were searching the area for Rhododendron. 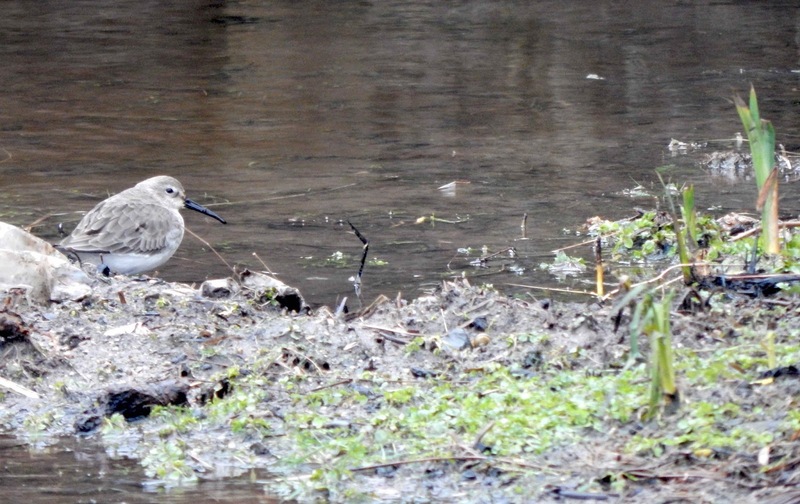 Snipe –14 on the 25th and 22 on the 27th, again flushed from around the Pondsbury area whilst the LFS Working Party were on the hunt for Rhododendron. 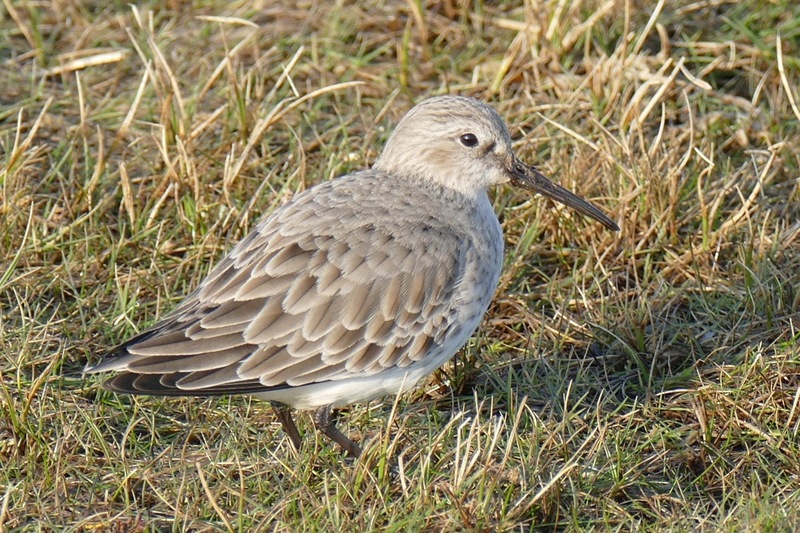 Dunlin – One at the North End on 23rd (Martin Thorne). Razorbill – 309 rafting off SW Point in the early morning of 27th. Herring Gull – 1,000+ roosting and feeding in Tillage Field on 26th (Martin Thorne). Common Gull – Three immature birds at the North End on 23rd (Martin Thorne). Skylark – Six on 28th has been the highest count since 21st. Fieldfare – One on Ackland's Moor on 1st. Redwing – No further records since three on 24th. Mistle Thrush – Unusual for Lundy at any time of year, and especially in winter, one was near the main-track Heinkel wreck on 26th (Trevor Dobie & Louise Cookson) and one was below Benjamin’s Chair on 28th (Dean Jones). Black Redstart – A 1st-year male below Benjamin’s Chair on 27th. Stonechat – Two on 25th and one on 27th. Pied Wagtail – One on 25th & 27th. Brambling – One on 24th. Linnet – Two on 26th (first of the month).